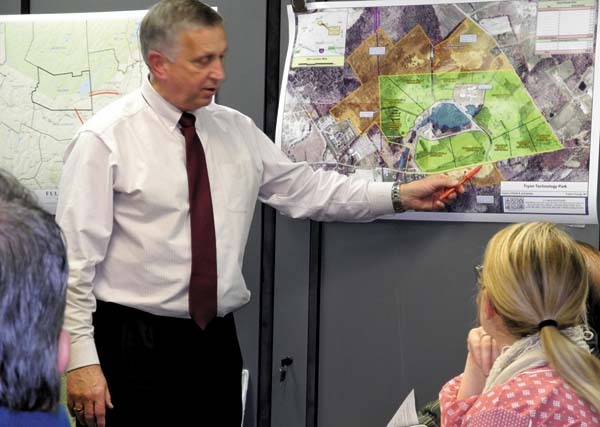 PERTH – The 515-acre Tryon Technology Park is in its infancy, but Fulton County officials have big plans for its future. County Planning Director James Mraz on Wednesday led area media on a tour of the County Highway 107 facility, which used to be the state’s Tryon Youth Detention Facility. Now, as Mraz explained, the Fulton County Industrial Development Agency has taken ownership and is working closely with county government to create developable land and prepare the park for businesses. “We are currently actively marketing Tryon,” Mraz said. Officials say they hope the Tryon Technology Park becomes a new home for high-tech companies. The Tryon facility and its future growth is part of a larger Fulton County economic development strategy aimed at bringing more jobs into the area to reduce the local property tax burden. Mraz, also the IDA’s executive director, said the Fulton County Demolition Team this summer took down an old building on the Tryon campus and is now razing five more for the creation of more than 100 acres of prime developable land. “That work is ongoing,” he said. The overall Tryon plan is to at least replace jobs lost when the youth detention facility closed in 2011. “We’re off to that start,” Mraz said of new job creation. The technology park currently has one tenant – medical marijuana manufacturer Vireo Health. The company has 20 employees. Various sections of the park will be divided into pockets of what Mraz calls “shovel-ready land.” There are 51.5 acres of such land off the park’s newly created County Highway 117, another 118 acres of land will be shovel-ready in an area to the east of the park bordered by County Highways 107 and 158, and another 44 acres is planned to the northwest. Many of the project sites among 260 acres will be around a loop in the center of the park. A future development area of 57 acres is being studied for the northern part of the park. The park already has water and sewer services, and a regional business training and incubator center is planned for an existing building. Mraz said that after the IDA took ownership of Tryon in 2014, officials immediately concerned themselves with job creation. The IDA also owns 30 acres across the road from the park entrance. He said many ideas for job creation spun from a September 2013 two-day visit by international site selector Michael Mullis to Fulton and Montgomery counties. New Jersey-based DCG Corplan Consulting has also done a marketing plan and analysis for Tryon that identified clusters of potential jobs. County officials are also working with engineering firm C.T. Male to reuse existing space at the Tryon campus. Money is available to bring the regional business training and incubator center to fruition through $185,000 in federal Northern Borders Regional Commission grant money, $50,000 from 2016 county budget funds, and $65,000 through the IDA. The hope, Mraz says, is to eventually create jobs through big or small companies. He said Fulton County will find a way to accommodate companies now at Tryon if it has to. Buildings at Tryon were built in the 1960s and 1970s. Some are structurally sound and some aren’t. Officials are looking at the former Midas building at Tryon for providing 16,000 square feet for start-up companies. “This building is perfectly set up for this,” Mraz said. The Midas-sponsored auto shop serviced vehicles at the state’s former detention facility. Michael Anich can be reached at manich@leaderherald.com. © Copyright 2016 Leader Herald.